CHANGE YOUR COMPANY. CHANGE THE LIVES OF OTHERS. CHANGE THE WORLD.An INFLUENCER leads change. An INFLUENCER replaces bad behaviorswith powerful new skills. An INFLUENCER makes things happen. This is what it takes to be an INFLUENCER. Whether you're a CEO, a parent, or merely a person who wants to make a difference, you probably wish you hadmore influence with the people in your life. But most of us stop trying to make change happen because we believe itis too difficult, if not impossible. We learn to cope rather than learning to influence. 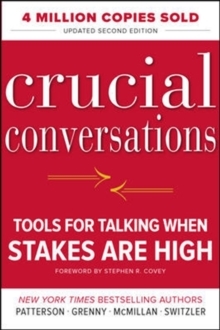 From the bestselling authors who taught the world how to have Crucial Conversations comes the new editionof Influencer, a thought-provoking book that combines the remarkable insights of behavioral scientists and business leaders with the astonishing stories of high-powered influencers from all walks of life. You'll be taughteach and every step of the influence process--including robust strategies for making change inevitable in yourpersonal life, your business, and your world. You'll learn how to:Identify high-leverage behaviors that lead to rapid and profound changeApply strategies for changing both thoughts and actionsMarshal six sources of influence to make change inevitableInfluencer takes you on a fascinating journey from San Francisco to Thailand to South Africa, where you'll see how seemingly "insignificant" people are making incredibly significant improvements in solving problems others would think impossible. You'll learn how savvy folks make change not only achievable and sustainable, but inevitable. You'll discover breakthrough ways of changing the key behaviors that lead to greater safety, productivity, quality, and customer service. No matter who you are or what you do, you'll never learn a more valuable or important set of principles andskills. Once you tap into the power of influence, you can reach out and help others work smarter, grow faster,live, look, and feel better--and even save lives. The sky is the limit . . . for an Influencer. 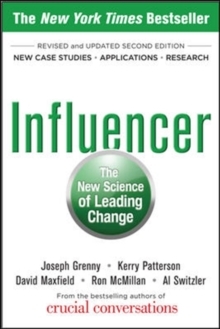 PRAISE FOR INFLUENCER:"AN INSTANT CLASSIC! Whether you're leading change or changing your life, this book delivers." -- Stephen R.
Covey, author of The 7 Habits of Highly Effective People"Ideas can change the world-but only when coupled with influence--the ability to change hearts, minds, and behavior. 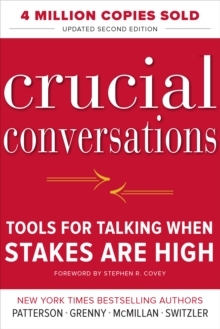 This book provides a practical approach to lead change and empower us all to make a difference." -- Muhammad Yunus, Nobel Peace Prize Winner"Influencing human behavior is one of the most difficult challenges faced by leaders. 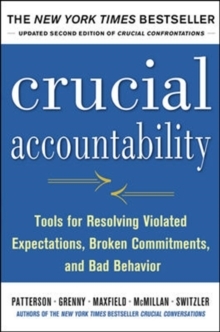 This book provides powerful insight into how to make behavior change that will last." -- Sidney Taurel, Chairman and Chief Executive Officer, Eli Lilly and Company"If you are truly motivated to make productive changes in your life, don't put down this book until you reach the last page.